Moisturizes preserving the hydrolipidic film. 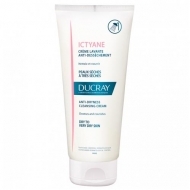 DESCRIPTION: Ictyane Gel Moussant Surgras from Ducray is an ultra-rich bath gel suitable for normal to dry skin. Formulated with extra nutritive and moisturizing agents, it preserves the lipid barrier of the skin during the shower. High tolerance formula with a physiological pH similar to that of the skin so it doesn't irritate. Contains in its formulation: Glycerine; Nutritious vegetable oils; Soft wash base; Floral perfume; High tolerance formula; Without soap, physiological ph.